Getfeedback have been running 360 feedback surveys for over 10 years and as a result have built up a substantial database. Our experience can be included in your reports in the form of a benchmark comparison section. 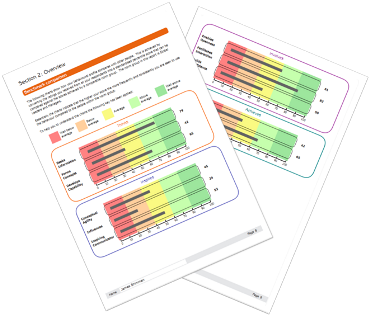 Whether you are assessing against the Schroder Framework of High performance or your own frame work, we can link your behaviours/questions to our database to allow your individuals to not only compare how the people they work with have rated their behaviours, but also compare themselves against the general population to develop a deeper understanding of their ability. For more information on our benchmark database please contact us.